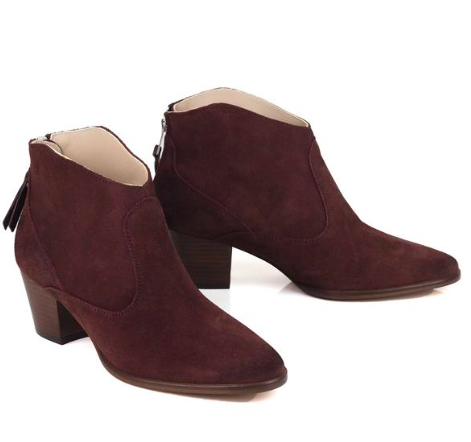 Nothing like coming back after a month away from the blog with a whole load of amazing bargains. 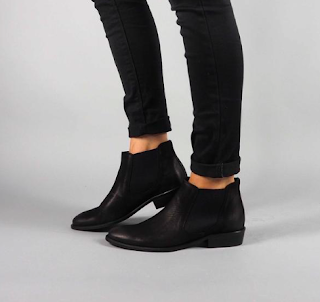 Yes, it's my favourite time of the year for snapping up the key pieces that you'll wear again and again starting with Seven Boot Lane ankle boots. I know I don't need more but when they're up to 50% off, this is the time to grab them. The quality is incredible - these are proper investment items. Finishing with shoes, not boots. 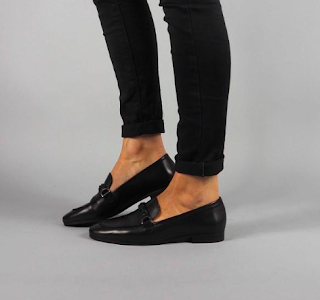 These are the most gorgeous loafers that if I'd not already bought my Dune ones, I'd snap up in an instant. Half price too! The most perfect spring shoe that you'll get tons of wear from over the next 4 or 5 months. Moving on now to coats. 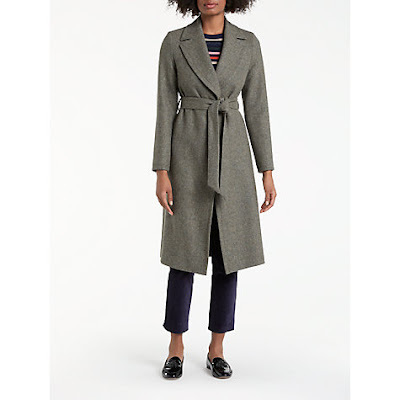 This is the best time of year to get that investment winter coat and when I say investment, I'm talking a classic coat priced around the £100 level and with as much wool or cashmere as possible. Nothing too crazy in terms of colour - this camel cashmere blend coat from French Connection is a good example. 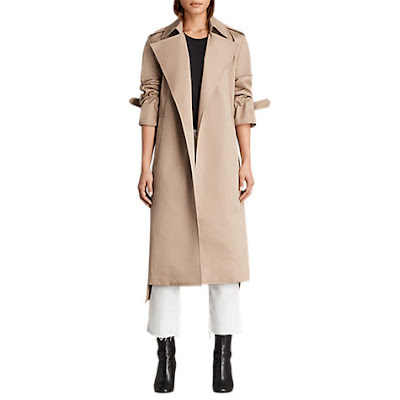 It's longer than I'd normally wear but I've had so many people ask me to suggest some longer length winter coats. This one is half price in their sale with good size availability and it also comes in black. 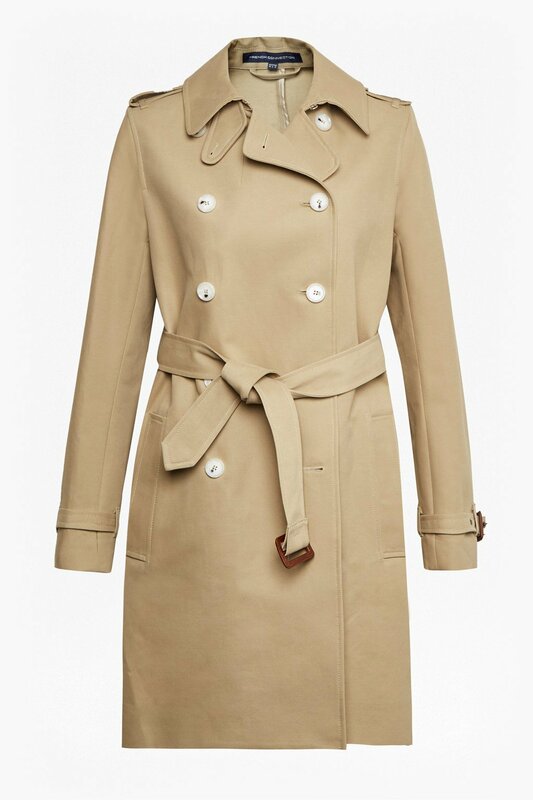 And another staple of your wardrobe - the trench coat, first up one from French Connection..
And this All Saints one from John Lewis is amazing value - only size XS and S left but it's an oversized fit. 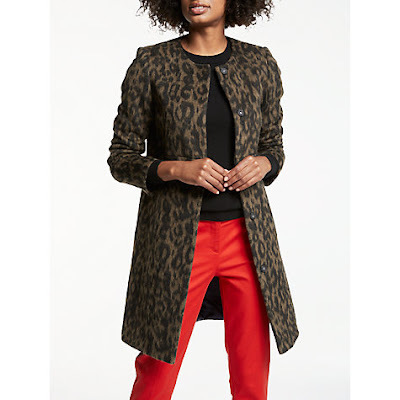 Or how about some leopard - I've admired this Boden coat all season and it's half price in John Lewis now. 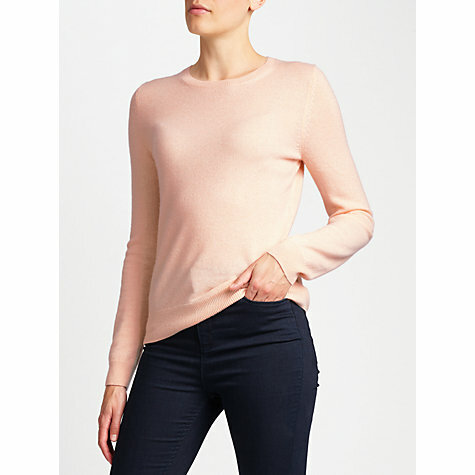 Next up - Cashmere and if there's any left in stock, snap up those 100% cashmere jumpers now. 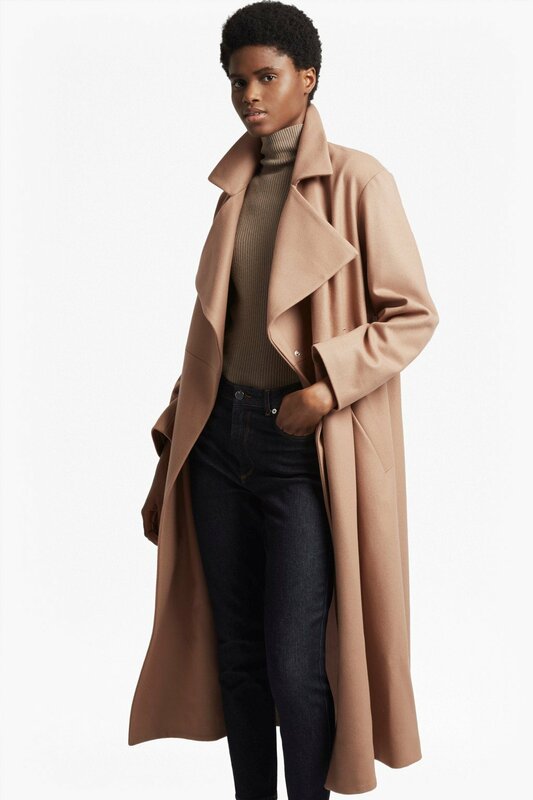 This pink one from John Lewis is just £45 - size 16 only but you could wash and tumble dry it and it'll drop a size (as mine did last year). Can't be sure it'll work just as well but I'll leave that thought with you! By the way, all the other colours are £79 which is still a great price for 100% cashmere that you will wear and wear. 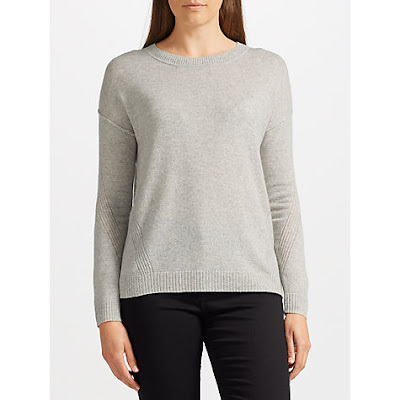 Meanwhile, over in Boden, some colours in their classic Cashmere Crew Neck are down to £78.40 including a light grey like the JL one above and this vibrant red/orange colour. 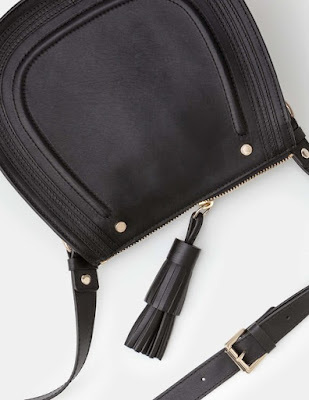 And we couldn't finish off investment sale shopping without looking at a few handbags and this Chloe-esque saddle bag from Boden will never age...beautiful leather too! Finishing with this black cross-body with chain strap....all the handbag love and again, another bag you'd wear and wear. I'm going to do a second post about the kind of one-off, fashion items that you should look to buy in the sales to. Stand by....the practical side of me is struggling with it but I'll do my best to have it live tomorrow. Disclaimer - some (not all) of the links above are affiliate links which means the brand involved knows I've referred you to their website and may pay me a small % commission (typically 3-5%) if you buy and keep something from their site. Feel free to google the brand on a separate window if you'd rather not use my links - though please don't give google the commission by clicking on an 'ad' link! I really want a crossbody bag but one that is big enough to carry around all the essentials my five year old girls require!! I was tempted by the Zohara Barker slouch bag in grey but the Boden saddle bag is gorgeous! My dream bag (at the minute!) 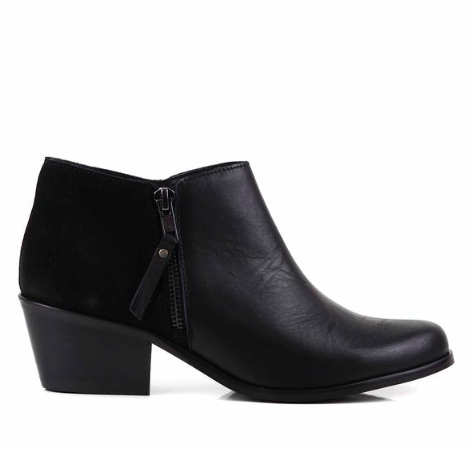 is a grey Chloe so v similar to the Boden. I took your tip from InstaStories about the M&S cashmere and bought the grey one (same as your black) for £36 in a size 22. Perfect slouchy fit, lovely sleeve length (even on my long, long arms) and a bargain price! I have the black on order online in an 18, thinking that one might actually fit as it should if they run so small!